Home » Stories of Success » Events » Spring 5K / 1-Mile Was A Hit! Spring 5K / 1-Mile Was A Hit! 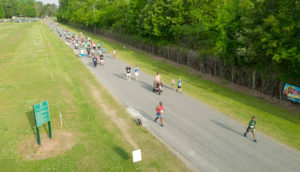 Hundreds of excited people turned out last Saturday, May 12, to enjoy the annual Healthy Suffolk Spring 5K Run/Walk and 1-Mile Fun Walk. It was a beautiful morning to come to Bennett’s Creek Park and get the blood pumping while enjoying the natural beauty of Northern Suffolk. We are excited for our next big race this fall during Peanut Fest. Registration is Now Open! We hope to see you there.